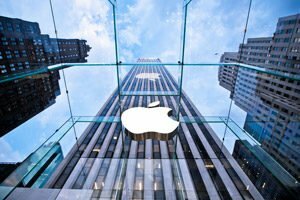 On May 1, Apple Inc. (Nasdaq: AAPL) released a stellar earnings report, pushing the company's stock up 4% in just one day. Despite the company's recent performance, many investors are still skeptical that Apple stock is still the best investment available. In just the last year, Apple's stock has already risen 36% – an increase that seems to give the company little room to continue its run. Investor confidence has also been plagued with rumors about cutbacks at several of the company's largest manufacturing plants in response to dwindling Chinese sales. However, wary investors are overreacting. You see, Apple has a long history of overcoming Wall Street's loss of faith. Whispers about supply chain issues or other tech problems rarely reflect the truth about the company's financial health – and the stock's profit potential. In January 2017, news that Apple was cutting iPhone production due to weak sales drove Apple's stock down 12%. While much of Wall Street cut and ran from the tech darling, we doubled down on Apple, arguing that the company's stock would gain 20% from $116 by January 2018. Apple stock ended up exceeding our expectations, rising 45% over the next year to hit $140 in December 2017. This was the same case in May 2016, when weak iPhone sales again drove the cost of the Apple stock down. Back then, we were convinced that Apple stock would stay the course and hit $130 within the year. And again, Apple ended up blowing past estimates, hitting $150 a year later. Apple's habit of smashing negative reports isn't an unknown phenomenon. In 2013, Apple CEO Tim Cook explained why it's a bad idea to give too much weight to dire warnings about Apple sales and glitches in its supply chain. "Even if a particular data point were factual, it would be impossible to accurately interpret the data point as to what it meant for our overall business, because the supply chain is very complex, and we obviously have multiple sources for things," Cook said in an earnings conference call. "Yields might vary, supplier performance can vary, the beginning inventory positions can vary, I mean there's just an inordinately long list of things that would make any single data point not a great proxy for what's going on." As Cook points out, many of the stories that drive the price of Apple stock down or limit the company's growth potential don't have the full picture – they lack the information necessary to give readers a fully informed opinion. Just look at the company's May earnings. Despite the negative press, Apple reported $61.1 billion in revenue and $2.73 earnings per share (EPS), far better than the $2.67 EPS expected. And rather than declining, the company's iPhone X sales outsold other phone models during the quarter. Plus, revenue in China is up 21% over the same period last year. It's clear that the media and much of Wall Street continues to miss the big picture on Apple.